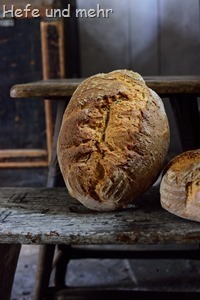 I could call this bread a simple “leftover bread”. But this would be to simple as the bread is a really delicious one. But to be honest, it contains a lot of leftover flours. There is the package of einkorn flour I found behind my flour box. And the bag with the little bit of spelt flour and another bag with some leftover rye flour. And as these three did not yield enough flour for a bread, I added some wheat flour, too. As I planned to bake the bread in the wood fired oven in our regional history museum, I had to plan accordingly. 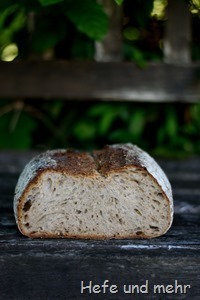 For an relaxed baking day, I prefer to knead the dough friday night and let it rise over night in the fridge. But this normally means that I have to prepare the preferment in the morning before I leave for work. But – with school years end so near – I knew I would be to tired that morning for mixing a preferment at 5:30 am. As workaround I decided to let the poolish ferment in the fridge as well. It needs about 24 hours then, but with a bit of planing ahead, it minimize the time I had to spent each day with preapring the bread. But last weekend I finally was back and it was so good to meet all the nice people there once again. 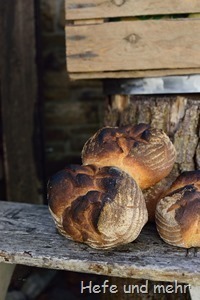 And as every time I was enchanted by all the little details around the wood fired oven and took many photos. 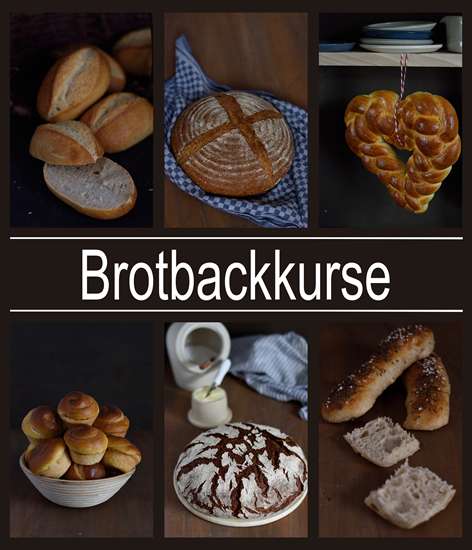 To honour the museum I call the bread I baked this time “Bergneustädter” as the Museum is seated at the historical centrum of the little town Bergneustadt. 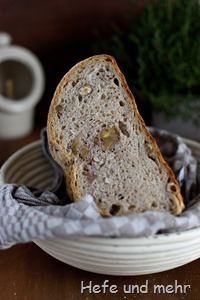 It is a bread made with white wheat and rye flour. To keep the bread moist for a long time I added a bit of potato flakes and a little bit of butter, too. The roasted malt enhances the subtle smoke notes of the wood fired oven. 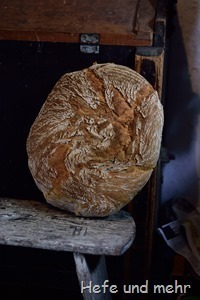 For rising the bread adding my hyperactive sourdough would be enough. But as a wood fired oven waits for no one I kept on the secure side and added a bit of yeast to make the proofing better controllable. So the bread needed 60 min to be ready for baking, which is fits perfect in the time schedule I have in the museum. 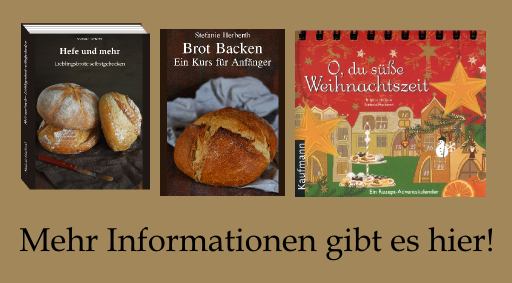 I posted our family favourite cake already some years ago here in the blog. When we have to choose between torte and goldknödel on a birthday celebration, all of us will take a piece of the goldknödel. It is THIS kind of favourite of extended family! The cake stems from the Transylvanian and Hungarian part of family heritage and is all by it self a rather simple pastry. It is made from a sweet yeast dough which is formed into small balls and coated with warm butter and a mixture of grounded nuts and sugar. 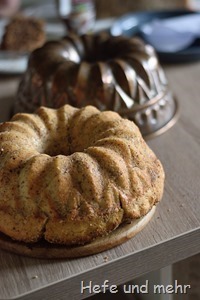 While baking in a kugelhopf pan the sugar caramelize and adds another delicious flavour to the aroma of nuts and butter. A Kugelhopf pan is mandatory for this cake. Wen the Teflon coat of my – rather cheep – pan started to fall apart after ten years of using I decided that I need something longer lasting. And so I bought an ancient brass kugelhopf pan. 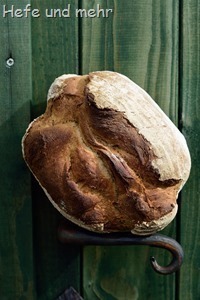 It has very good baking qualities, is rather everlasting and looks beautiful on my kitchen wall when not in use.